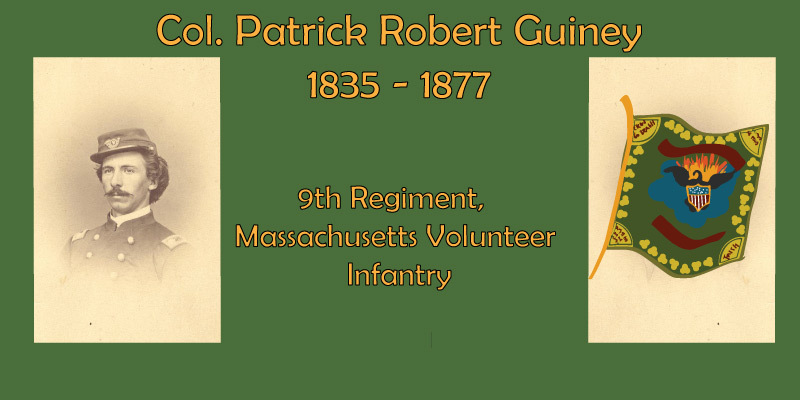 Patrick Guiney was born in Ireland in 1835 and immigrated to the United States, settling in Maine. He attended the College of the Holy Cross in Worcester, Massachusetts for one year, and later studied law and opened a practice in Boston. In 1859, Guiney married Jeannette "Jennie" Margaret Doyle, with whom he had two children. When the Civil War began he left his practice and enlisted as a private with the 9th Massachusetts Volunteers, a regiment organized from Boston. He was eventually promoted to Colonel and led his regiment in campaigns fought primarily in Virginia. At the Battle of the Wilderness, he was seriously wounded in the eye and was soon after discharged from service. After the war he unsuccessfully ran for Congress, but served as Assistant District Attorney and Registrar of the Probate Court in Suffolk County Massachusetts. He died in 1877. During the war, Col. Guiney wrote a series of letters to his wife Jennie, dating from June 4, 1861 to April 7, 1864. As historical documents, these letters provide details of various campaigns as as well as descriptions of everyday life in the regiment. They are also a poignant testimony of the tenderness and love expressed by a man for his family during wartime. The Guiney letters make up a significant portion of a collection donated to the College of the Holy Cross by Patrick Guiney’s daughter, the poet and scholar Louise Imogen Guiney. The original letters are currently located in the Special Collections of Dinand Library at the College of the Holy Cross and are available to researchers.